Aiseesoft iPod Photo Transfer 6.1.30 無料ダウンロード - Import local photos to iPod, and export iPod photos and camera roll to computer. Aiseesoft iPod Photo Transfer is the best iPod Photo Manager which can help users import local photo files to iPod, and export iPod photos and camera roll to computer or iTunes without losing anything. Also it allows users to transfer photo files between different iOS device(iPod, iPad and iPhone), delete the unwanted photos, and preview all the iPod photos with the preview window. You can import the local photos to iPod with this versatile software, and then you can enjoy all the favorite photos on iPod whenever and wherever you go. Aiseesoft iPod Photo Transfer allows you to export the selected iPod photos and camera roll to your computer and keep the original quality. This iPod Photo Transfer has the ability to export photos and camera roll from iPod to other iPod devices. This free iPod Photo Transfer highly supports: iPod 1G, iPod 2G, iPod 3G, iPod 4G, iPod classic, iPod mini, iPod nano 1, iPod nano 2, iPod nano 3, iPod nano 4, iPod nano 5, iPod nano 6, iPod shuffle 1, iPod shuffle 2, iPod shuffle 3, iPod touch, iPod touch 2, iPod touch 3, iPod touch 4, iPod Video, iPhone, iPhone 3G, iPhone 3GS, iPhone 4, iPhone 4S, iPad, iPad 2, The New iPad. 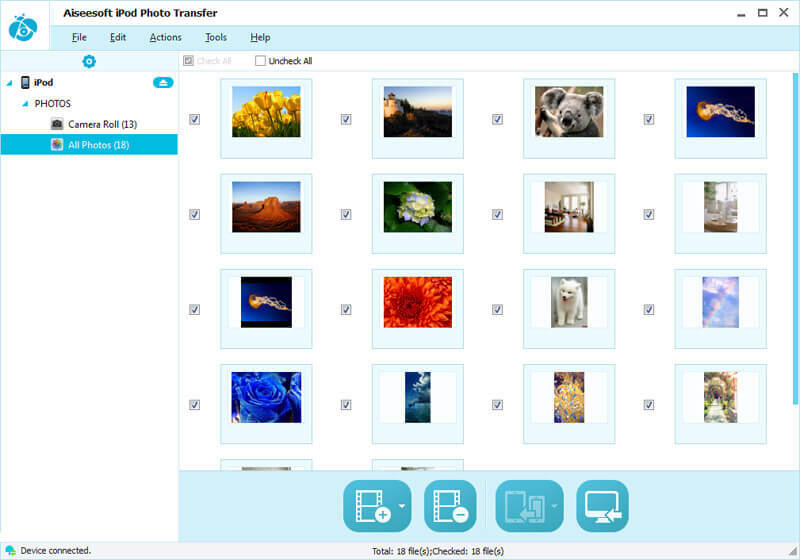 Aiseesoft iPod Photo Transfer owns a user-friendly interface, which can simplify all operations. With the concise design and high technology, you can finish all transfer process only in a few clicks.